Ashanti Guest House in Germiston provides accommodation and offers their guests Bed and Breakfast. The Guest House is located very close to OR Tambo (Johannesburg) International Airport, and has been graded as a four star bed and breakfast by the SA Tourism Grading Council and has been rated as a “Highly Recommended” bed and breakfast by the AA. Ashanti Guest House offers a sophisticated alternative to hotels. Experience the difference! Ashanti Guest House is centrally locatedand within 10 minutes of large shopping complexes (Eastgate Shopping Mall, East Rand Shopping Mall) also nearby for gift shopping are the Bruma Lake Fleamarket and the East Rand flea market. For those wanting some fine dining, Ashanti Guest House is close to a large number of restaurant venues - each offering a variety of culinary experiences as well as the Emperors Palace Casino which offers 24 hour entertainment. 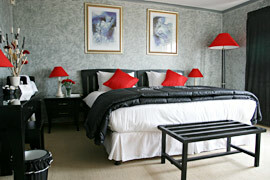 Ashanti Guest house comprises of luxury twin / double rooms each with its’ own décor and style. With rooms on the upper level and ground floor. Two of the rooms on the upper level have double glass doors that open onto a small balcony overlooking the front garden. The view of the night lights from this balcony are enchanting and many a guest sit outside on the warm African evenings. Each room has a colour TV with the normal SABC channels as well as two other channels, a security facility for guest valuable and a hospitality tray for in-room tea / coffee making. Supplies for the tray are filled daily and include biscuits / rusks and fresh fruit. Guest amenities include a range of luxury items such as bubble bath, hand soap, body lotion and shampoo. The breakfast is included in the reasonable rates and offers a full menu. There is a buffet component offering a variety of cereals, yoghurts, fruit juice, baked goods and herbal / fruit teas. The cooked part of the meal is made upon order, fresh from the kitchen and has a very large menu. Conference facilities consist of a room / table that can seat 12 in boardroom style. The room can also be set up for interviews, small product presentations and training. Ashanti offers the guest excellent security. Guest vehicles are parked on the premises behind remote controlled gates. Guests are provided with the remotes for 24 hour access. There is a small BBQ / braai area where guests can entertain and the hosts will willingly assist with any requirements for a BBQ / braai. The hosts will also assist with the arranging of tours. Assistance can be provided on information for all areas of South Africa. Dinner is by arrangement and airport transfers can be arranged. Member of the Guest House Association of South Africa. * Check out at 10hoo, Check in from 14hoo. Where a credit card has been used to pay the deposit, bank charges for the transaction will also be deducted from all deposits returned.